I hate COD but Blackout is amazing. Don't listen to the haters. Bo4 is great. Best cod since mw2. Does Gold Edition include all the zombie chronicles dlc ? Well blow me down with a feather! I did click it it's even on my external drive! Yes and (I guess) no, respectively. is playing online free? is there much people on it? I'm serious lol, this is amongst my favourite CODs to date. I have this on Xbox but prefer PC. MW2, BO2 and BO3 are my top 3, was hyped for BO4 with Blackout and the major changes but I'm really not a fan. The game feels stale, so I'm going back to BO3. Not sure if trolling but I’ll take it (embarrassed) pleasure is all mine! And the person who posted this "deal"
I'd rather they not because of the employees there and also they still have the odd deal worth buying or like their occasional console trade-in offers. Also it might be weak competition but they still have a presence in the gaming industry and it helps keep those other players in check somewhat. Having said that, their stores are predatory and there was a time when I didn't know better either or rather there was little choice. Glad online stores have given them a run for their money but during seasonal highs, they will still sell these games at these inflated prices. Nothing beats a physical store during the xmas shopping run but yeah they're on borrowed time. Great game, I'm surprised they didn't go forward with the co-op campaign in recent games like they did with this one. Was free on psn plus a few months ago and it is truely awful. COD: Black Ops 4 Beta Codes Free Sony Xperia Lounge App. I have 2 codes if anyone wants 1, just give me a message. Anyone got any xbox codes left they could PM me please? You are correct, buying the DLC ruins your matchmaking permanently. Complete waste of money. That's why the community should vote with their wallets. They will soon change their tune. Agreed, R6S has absolutely nailed it to be fair. I've not bought a season pass on there, but having the content release as it does it just the perfect balance. The game is clearly well-supported as it's being supported continuously. It's a shame Activision have made it so that with BLOPS 4, you can either have the season pass or not. I get that it causes less fragmentation of the userbase, but it's also scummy and forcing players into a total shell out of around £90 for the actual full game experience, when they could adopt the system that nearly EVERY other developer out there is pushing. You should've deleted the disc version and downloaded the ps plus version . Maybe a glitch ?! Anybody else lost this game? I added this to two PS Plus accounts, both where the games was already installed from disk (so never downloaded at that point), but I now I don’t see it to download or even the transaction history. Maybe for the same reason you came to comment on something you don't like? I think this is one of the better COD's in ages, loved the movement system, not over the top like Advance warfare, but fun and balanced. also not a fan of WWII, and its evident by the games constant price drop that not everyone's liking it either. 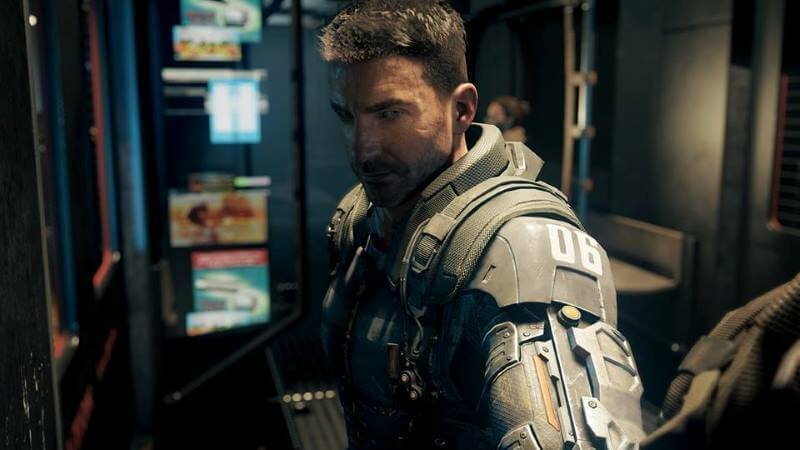 Never miss a 'Call of Duty: Black Ops 3' deal again! Well said reddragon he is just a troll he does it in every thread. He seems hell bent on spelling and grammar then complains when someone takes the time and effort to provide a comprehensive reply like you did - just ignore him and he will fade into obscurity! Probably sitting in his one bed flat thrashing away with one hand on the mouse and the other under the table at his sad attempts to get a rise out of folks - my his life must be pretty sad and boring - You have to feel sorry for his type , so many of them on social media! "Care to explain how this is in any way similar to "every other company in the world"?" Proceeds to ignore explanation because it's too many words. 12 lines isn't an essay (unless you're taking one of those dodgy online courses). Try reading it - it won't give you an aneurysm and you might learn something that will stop you making naive comments in the future. "I don't see why we need to have this conversation" proceeds to write an essay lol. No one is reading that. Because a core concept of business is 'buy low, sell high' and many companies take advantage of weaker economies in other countries to buy from/have things made in countries where it is cheaper to do so and then sell them in countries with stronger economies where they can charge higher prices. So in that respect buying game keys in bulk from, for example, a Russian store, where they're much cheaper and then advertising them in countries like the UK, where you can charger higher prices, is no different to getting clothing or electronics made somewhere like China for sale at premium price in the western world. If you have some sort of moral objection to this kind of business practice there are a lot more products and sites you should be boycotting. I don't see why we need to have this conversation every time a deal like this is posted. People say 'gray market' like it's illegal (because it sounds like black market, which is the illegal version) or immoral - it's not. The only real argument to be made is that buying through a site like CDKeys means the developer will get less money from you, but a) whatever price they've set, even in the cheaper countries, means they will be getting some money, and it must be an amount they're okay with, and b) if you're shopping around for game deals you're unlikely to be paying full price for the game anyway, so if this is the only way you're going to buy it then at least the developer gets some money from you instead of nothing (glass half full perspective). So what? It isn't illegal. The publishers' business model involves charging you a higher price for no other reason than the region you live in. It's not like they're standing on the moral high ground! Do many people still play this online? Really tempting. Use fb code for further money off. Game is broken after most recent patch. Re-installed today and my GTX 1070 is capped at around 19 - 24 FPS no matter what graphical settings or resolution. Game ran perfectly a few months ago so i currently wouldn't recommend this game. Seems like it hit many people looking at the Steam community discussions. No problems ever with cdkeys but how is the best way to get the full game I want all the zombie maps £10 is cheap but not if I have to get season pass and then chronicles on top! Anyone have any ideas? I've been using CDKeys for roughly 3 years and have never had to give ID. Every CoD game since Modern Warfare seems to get slated. For someone like me who has never played CoD, and has just got an XBox One, what is the best CoD for single player campaign only? Seconded, tempting to get this but not if its dead. Many people still play this online (PS4)? Heat added btw. So tempted....I know I shouldn't. How the hell was this voted cold!? The xombies chronicles DLC has never gone below £25 since it was out in May so £3.85 for the game. People are obviously buying it then. Its a simple concept of supply and demand. Also GTA V is almost years old and thats still being sold for £50! The DLC alone costs £25 on the store, which came out May/June. The game plus the DLC for this price seems pretty good to me. Not hard to read. "Call of Duty®: Black Ops III Zombies Chronicles Edition includes the full base game and the Zombies Chronicles content expansion." £30 pound for a two year old game? are you nuts? they had COW infinity warfare on here a few days ago for just £5 pounds and that's only a year old. Am I right in thinking this is the game that is required to play/download Zombie Chronicles? For over ten years, the Call of Duty franchise has allowed gamers to enter the world of World War Two infantry – mixing a high-quality, first-person 3D engine with a level of historical authenticity that gaming had never seen before. Released by Activision, the first instalment in the Call of Duty series appeared in 2003 on Microsoft Windows, and included missions involving American, British and Soviet troops. The first Call of Duty was joined by a sequel in 2005, and was released for Windows, the Xbox 360 and mobile devices. This version tinkered with the graphics and added elements like regenerating health bars, but its most important addition was multiplayer gaming. Players could now engage in death matches and team games featuring as many as 64 people (on the PC). Call of Duty 3 arrived in 2006. The first two games had proved a huge success, and the third instalment expanded it to the Nintendo Wii and the PlayStation 2 and 3. However, it did not receive a home computer release this time around. COD 3 made multiplayer gaming more accessible, including rankings and it also incorporated the unlocking of achievements. The fourth sequel followed in 2007, with a fresh version for Windows and a handheld version on the Nintendo DS, as well as the other major consoles. This time, the action took a huge leap forward in time, featuring modern missions in Russia and the Middle East. In 2010, the Call of Duty series expanded with the first Black Ops title. Released across all major platforms, Black Ops included innovations like customisable weapons and social media functions. More items could be unlocked, such as unique face paints for every different character. This was followed by Black Ops 2 in 2012, and then Call of Duty Black Ops 3 in April 2015. What Is Call of Duty Black Ops 3 All About? The 12th iteration in the Call of Duty franchise was released for Windows, Xbox One, and PlayStation 4, stripped down versions came out for PlayStation 3 and Xbox 360 as well. The action in Call of Duty 3 is much more futuristic than its predecessors, which focused on the Cold War. This time, missions are themed around challenges like the fallout from climate change and advances in robotics. 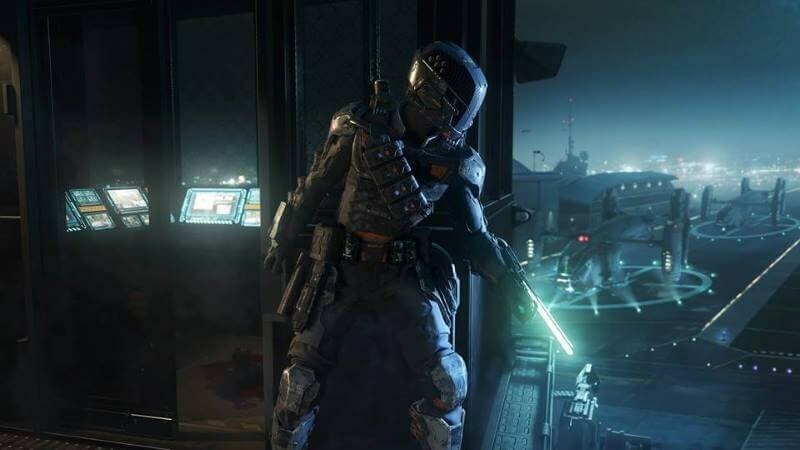 In the single player mode of Black Ops 3, players have to deal with cyborgs intent on taking over humanity, carrying out covert missions behind enemy lines. There is a complex plot involving a technology known as Direct Neural Interfacing – which fuses men and machines. In some ways, the game brings a version of the Terminator universe to life in unprecedented detail. In the Campaign Mode, gameplay is structured around a squad of four main characters. These can be controlled individually by four human players, or they can be left for the AI to control if you don't have enough players to cover them. There are different difficulty levels to choose from, including a "realistic" mode where one bullet spells the end of your game. There is also a wide range of weapons that must be unlocked as you progress, adding more depth to the game the more time you spend with it. 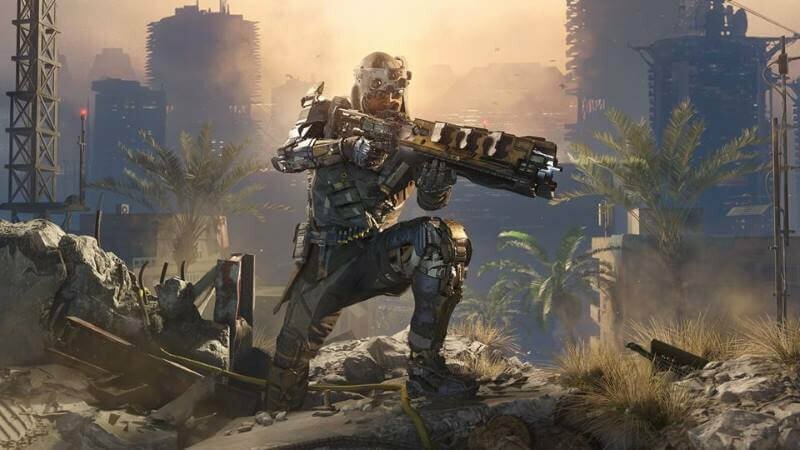 As with earlier versions of the Call of Duty franchise, Black Ops 3 has a popular multiplayer feature which has added new gameplay features to make characters easier to play with. 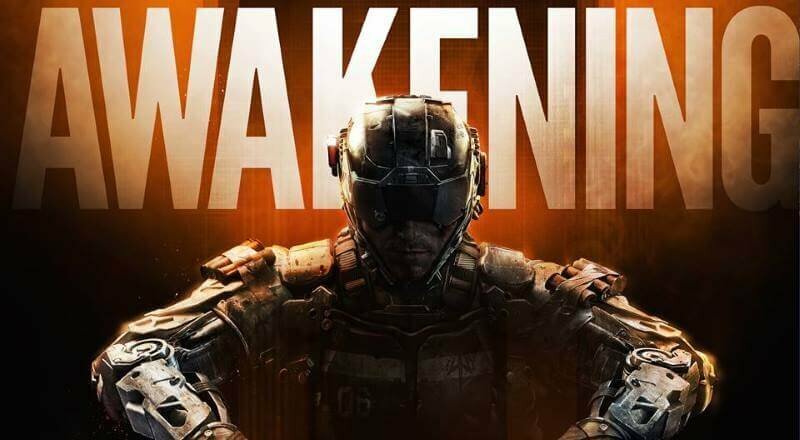 A paintshop function lets users create visually customised characters, and there are now nine different classes of character to choose from: Ruin, Outrider, Prophet, Battery, Seraph, Nomad, Reaper, Spectre and Firebreak. Call of Duty Black Ops 3 isn't all about moody futuristic fighting, it also has a moody noir section involving zombie fighting. Set in the 1940s, there are two zombie-related storylines to explore, with distinctive weapons and a completely separate narrative to the main game. The game has three different Zombie maps. 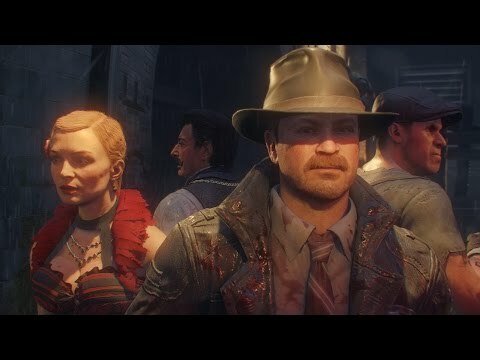 The first, which is available to all Black Ops 3 players, is called Shadows of Evil and takes place in an American town called Morg City. Players have to defeat an Omni-present villain called the Shadowman, with the help of power up machines and plenty of firepower. A new feature called "beast mode" also enables players to unlock different parts of the map, and to defeat the hordes of zombies that inhabit Morg City. The second Zombies map is called Giant and is only available in the Collector's Edition of Black Ops 3, while the final map is called "Der Eisendrache" and is found in the Awakening DLC map pack. 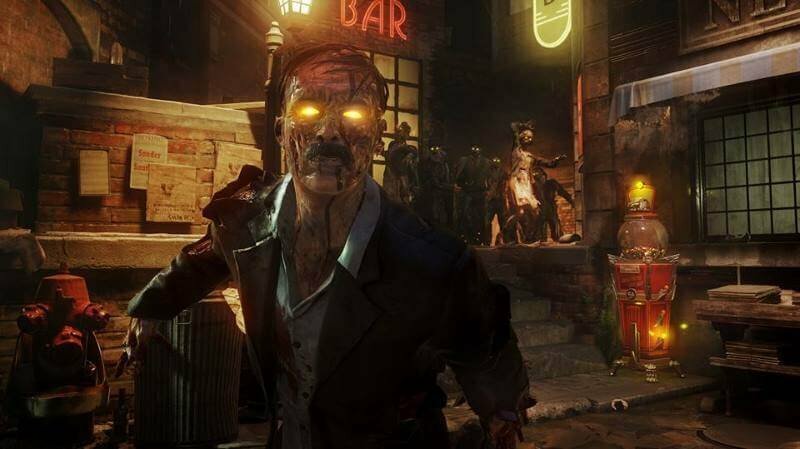 Games of Zombies can be played in single or multi-player modes with one to four people playing on the same map. The aim is simply to kill as many zombies as possible before all of the players are killed. By killing zombies, the players accumulate points, which are then used to buy extra weapons or power ups such as juggernog – the restorative potion found across the Call of Duty franchise. 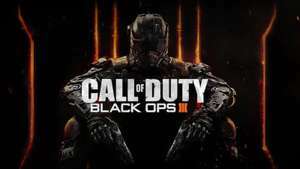 A full version of Black Ops 3 was released for the Xbox One, PlayStation 4 and Windows, while a stripped down version came out for Xbox 360 and PlayStation 3. Windows users will require at least a 2.9 Ghz processor, 6 GB of RAM, 60 GB of hard disk space and Windows 7 or above in order to play the game. However, to get the most out of Call of Duty: Black Ops 3, 8 GB of RAM is recommended along with a 3.3 Ghz processor. On older consoles like the Xbox 360 and PlayStation 3, players cannot play split-screen matches against friends in their living room, there is no Campaign Mode, players cannot buy a Season Pass and there is no Zombie mode, so the differences are significant. On next-generation systems, the game has been released in a number of different editions. The cheapest version of the game is the Standard Edition. This includes both single and multiplayer options for the Xbox One and PlayStation 4 versions. However, the Xbox 360 and PlayStation 3 versions do not include the single player Campaign Mode and are limited to Zombies and multiplayer games. The other major option is to purchase the Digital Deluxe Edition of Black Ops 3. This includes all aspects of the game itself, but also comes with a Call of Duty Black Ops 3 "Season Pass". This allows players to access any updates, maps or other content for the main game and the Zombies section. When the game was released, a "Hardened" edition was also made available. This comes with extras like a steel book, specialist concept cards and four extra maps, including a huge World War Two Zombies map set in a Nazi research centre (although it doesn't include a Season Pass). 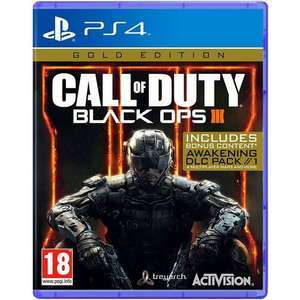 A PlayStation 4 Call of Duty Black Ops 3 bundle was also released in 2015 featuring a games console and controller with a distinctive Call of Duty trim and rapid access to any new map packs as they are released. Similarly, Microsoft have launched their own Call of Duty: Advanced Warfare bundle with the Xbox One console. All Call of Duty games are played on sprawling maps, whether they are World War Two era military bases or post-apocalyptic wastelands. As new missions are added to the game, new map packs are made available by the developers, and these maps quickly become battlefields on the multiplayer version of the game. No serious Call of Duty player will want to be without them. You'll probably read about maps being DLC content. In this case, DLC stands for "downloadable content" and all maps need to be downloaded from their creators (Treyarch or Infinity Ward). Map packs can be purchased as part of the Call of Duty Season Pass, but they can also be bought separately. Currently, they span a wide range of environments, from aquariums in Singapore to research outposts in the Sahara and Metro stations in Switzerland. There are also specific map packs for the Zombies segment of Black Ops 3. These allow players to take their action onto the moon, with new forms of futuristic weaponry. 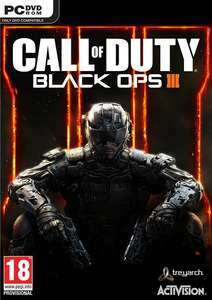 All of these map packs can be purchased from retailers hosted on HotUKDeals, such as GAME. These merchants will provide Microsoft Points or PlayStation Network credits that can then be used to download the new maps. Call of Duty has spawned a huge array of accessories due to its massive popularity. Players can purchase Call of Duty branded controllers for PlayStation and Xbox consoles. They can find Black Ops 3 clothing, posters and even coffee mugs. You can even buy Black Ops 3 branded thumb grips to apply to the pads on your controller. Useful accessories include specialist gaming headsets like the Astro A40, which can enhance your multiplayer experience. With the right headset, you can ensure that team members in your squads pick up all of your instructions and advice clearly, while wireless headsets also allow you to be as mobile as possible as you play. Some players also like to invest in USB keyboards that plug straight into PlayStation and Xbox devices. With First Person Shooters like Call of Duty, the precision control offered by a mixture of mouse and keyboard is often the easiest way to master the game. Are There Any Cheats For Black Ops 3? 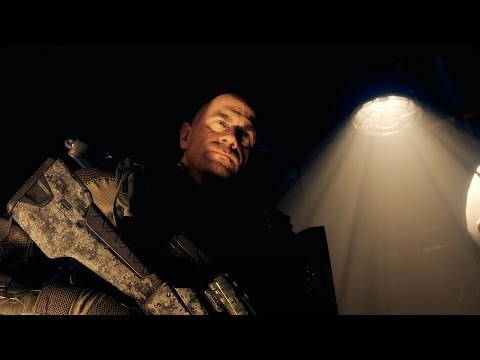 After beating the first two missions on Black Ops 3, players gain access to something called the Black Ops Safe House. When you reach the Safe House, head to the Data Vault, which can be opened by pressing X. Now, scroll up to the top left of the screen – hold the right trigger button and then press X and Y in succession (square then triangle on PlayStation controllers). When you have completed this operation, a cheat menu called the Dreamland should appear where you can enter codes to unlock certain weapons and other features. Type in the word "manifest" to acquire 100 free fabrication kits, or enter "dreamland" to instantly unlock the Nightmare zombie mode without defeating the campaign mode. These cheat codes are known to work, but you may come across people selling access to hacks such as free aimbots that can vastly increase your firepower, or instant upgrades to level 1.000. Be cautious of hacks that aren't officially sanctioned. If you are found out, you could lose all of your points or be banned. Hacks may also be a route for criminals to access your personal information. It is also possible to buy modded (“modified”) controllers that feature less recoil and offer enhanced aiming offering an advantage to players. These controllers are also technically banned by the developers, so beware if you choose to use them. Call of Duty Black Ops 3 can be downloaded directly from Xbox Live or the PlayStation Network. In both cases, the file is around 45 GB, so expect your download to take a while to complete (between three and even as many as 10 hours is normal). PC users can also download the game via Steam. 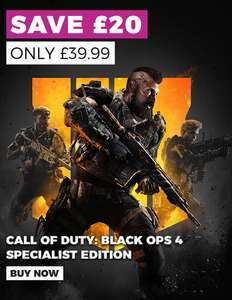 All versions of the game can be purchased in hard copy from the UK's major electronic gaming retailers, who are offering discounts on the various Black Ops 3 packages, as well as Season Passes and points, from time to time. At HotUKDeals, you can scroll through the latest deals on Black Ops 3 packages from merchants like Electronic First, GAME, Amazon and Tesco. Check out the deals at specific times of year to save even more money. Electronic products like Call of Duty tend to see huge reductions around Black Friday (or Cyber Monday) in November, along with the January Sales. However, be sure to check the Black Ops 3 pages at HotUKDeals regularly, as map packs and Season Passes are always on offer.